Penny Loves Kenny is a brand I haven’t been paying a whole lot of attention to lately, which is a shame, because their shoes are just so much fun. 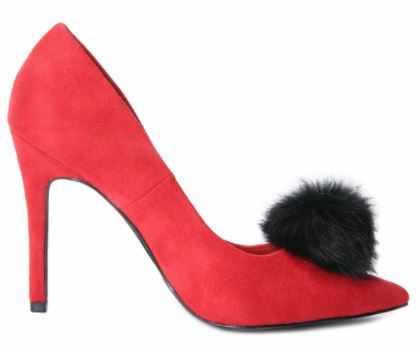 This isn’t a brand that’s sold in the UK, as far as I’m aware (Happy to be corrected on this, but if I’m right, then apologies to any UK readers who’ve always wanted a pair of bright red shoes with a black pom pom, and opened this post thinking their time had finally come! ), so I have no idea what the quality of the shoes will be like, but I can say that they look cute, which has to count for something. These shoes actually come in a few different colour combinations (Some of which are even louder than this one! ): I’m showing you the red and black version, because I’m sure you’re all aware of my “thing” for red shoes by now, but although I don’t think you can really go too far wrong with this particular combination, it is a very bold look, which might not be the easiest to style – especially when you factor in the pom-pom detail on the toe! That toe embellishment makes these seem more of an evening style than a daytime one, in which case they’ll make a refreshing change from all of the metallic sandals you generally see as evening wear. (Not that I don’t love those too, of course!) I hesitate to mention the Christmas party season here, as we haven’t even made it past Halloween yet, but if you’re much better at planning ahead than I am, and are already starting to think about your party wardrobe, then I have to admit that there’s also something very festive about these shoes, which could make them fit right in.